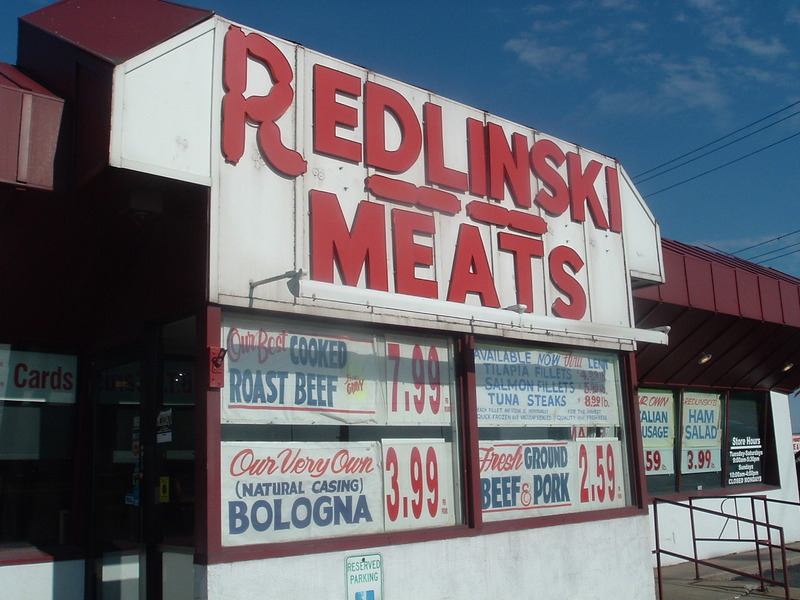 I was taken on a very special tour of Buffalo yesterday: the old Polish neighborhoods on the East side. Churches and butchers. Sacred and profane. Spirit and flesh. Just how I like it. While not as horrifying as the cracked-out rubble of the once bustling neighborhoods of Detroit, Polonia is a melancholy place, marked by all the signs of decline and poverty. But with my charming tour guide — a third-generation local –the boarded-up windows, pawn shops, stretches of painted concrete and empty lots became corner bars and sausage factories and shoemakers and polka palaces again. I would urge you to find someone who can give you a tour of your city. The architecture, even overwritten by generations of changes and decay, tells fascinating stories of how we shape space into communities and barricades. 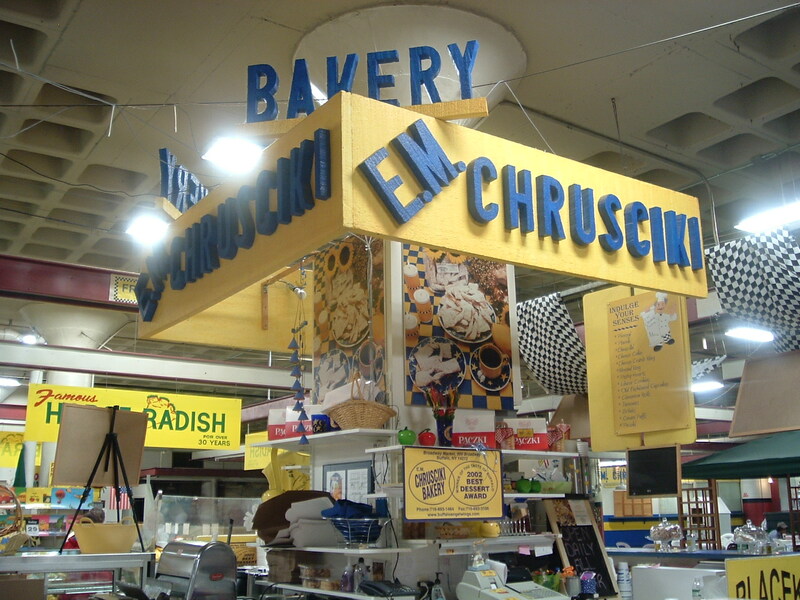 And if you can still get gołąbki, pirogies, and a side of czarnina with a chrusciki chaser, all the better. I’ll be flying back to Eugene this weekend, and I’m glad to be returning to the town that I love, but I’ve grown fond of Buffalo in the month I’ve spent here. 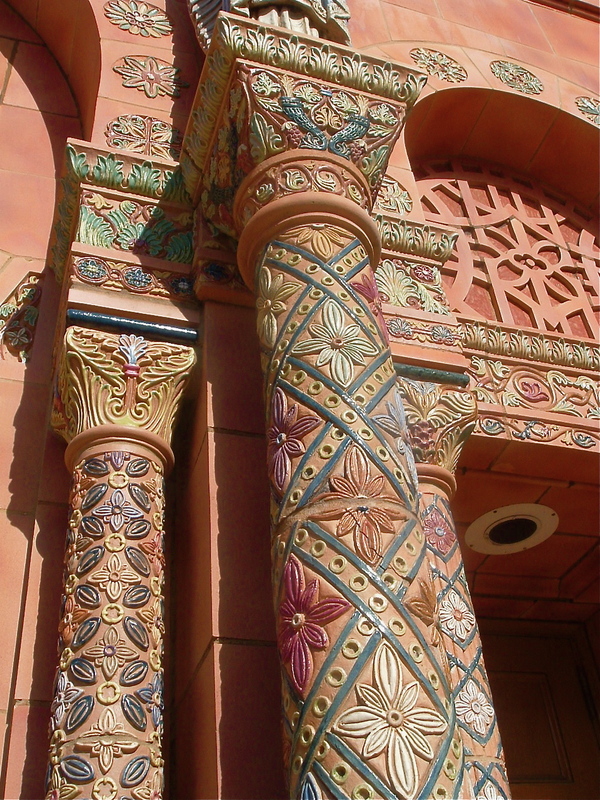 Great libraries, Polish food, fascinating history. Not too shabby. Luckily, I get to return in June! Tonight’s the night for pizza, no? OSU Extension in Lane County requests our support in a delicious, cheesy, tomatoey, crusty fundraising event. Yes, it’s sponsorship via pizza! If you visit any Papa’s Pizza location in Eugene or Springfield today, Monday, April 27, our beloved Lane County Extension programs will receive a significant portion of the money you spend. Programs like Master Gardeners, 4-H, and Master Food Preservers — each providing education and services you can’t get anywhere else in town — are still struggling with significant budget shortfalls, so please make tonight your weekly pizza night. Won’t your wife/husband/partner/kids/chosen family/imaginary friends/pets be thrilled when you show up at home with a fragrant, piping hot, vegetable and pepperoni-laden melted cheese surprise this evening? And your coworkers — won’t they be overjoyed that you brought a big pizza pie of amore to share at the noon hour, making a celebration of an otherwise bleak Monday? Yes, they will. Picture it. Your heroism. The love and adulation. Full bellies and smiles. Here’s the deal: print out the coupon available at this link and bring it to any Papa’s Pizza location today, Monday, April 27. The coupon will entitle your local Extension to receive 50% of proceeds from food purchases, and 25% from gift certificates purchased. That’s right, even if you find you don’t want pizza today, you can still donate to OSU Extension by buying a gift certificate for future pizza parties. Please note that this the coupon won’t work with delivery – you have to be physically present and you have to bring the coupon with you. There are paper copies of the coupon at the Extension office at 950 W. 13th, if you’d prefer to come pick one up. Thank you so much, and please know your pizza will help continue providing the services that make Lane County life more beautiful, healthier and safer. If you’ve ever used the gardener or food safety/preservation hotlines or tested your canner gauges or identified a weed or purchased high-quality plants at a sponsored plant sale, please show your appreciation today! Rhubarb is one of my favorite words, and for good reason: it’s the word of the people. For many years in the film industry for the background noise of the crowd, extras would murmur, exclaim, and kvetch “rhubarb, rhubarb, rhubarb” at different tones and timbres. Crowd pleasing and pretty enough for the pictures! Good enough reason, I’d say, to reintroduce rhubarb to the cocktail party. Ruby stalks of love have started appearing in the farmers markets in the Willamette Valley. (Gardener tip: don’t discard the leaves from your rhubarb plants; make a natural pesticide instead.) Food blogs across the land have started posting rhubarb recipes. I think back to olden days here at Culinaria Eugenius, when in my rhubarb foolish youth I did the same. Ah, spring. I was vexed the other day thinking about how rhubarb bleeds its brilliant color when you boil it, leaving a greenish, soggy fruit behind that makes such delights as rhubarb crumble more brown than red. Sure, strawberries are often combined with rhubarb in pies and such to combat the problem. I’m not one to complain about that brilliant combination, and the strawberry brings the red to the party. But strawberries won’t be in season yet until June, and no one wants to eat the California sour red orbs. And what about that lovely rhubarb pink? Serendipitously, as I was musing with my fingers on keyboard, I came across a brilliant (i.e., thinking the same thing I was but in a better way) post of my new cooking BF, British food writer Nigel Slater, on rhubarb. Not only does he use the adjective “cork-sized,” he suggests taking the edge off Saturday vacuuming by fixing oneself a big glass of rhubarb-gin-n-soda first. 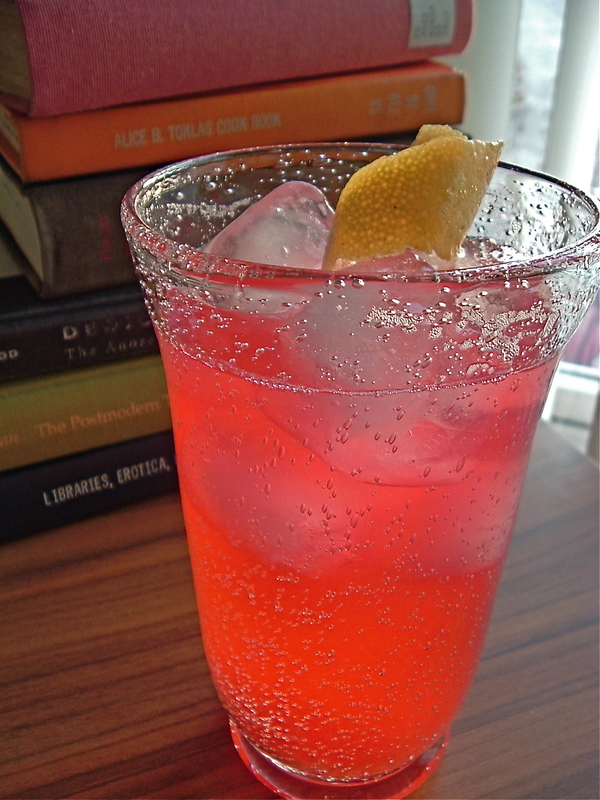 Decant bit of rhubarb syrup in a tumbler, he encourages, top it off with a splash of gin and mineral water, and you’ll have a cheerful morning. See why he’s my new best thing? Check out his column in the London Observer here. Fantastic writing. Simple. Delicious. In a 12-oz (16-oz? the sky’s the limit) tumbler filled with ice, add your lovely pink rhubarb syrup and gin. Top off with mineral water and a couple dashes of Fee’s rhubarb bitters, if you have them. A grapefruit peel garnish will lend a little bitterness, too, just right for a morning in which you need a drink spring cocktail parties with locavore friends. Rhubarb rhubarb rhubarb rhubarb. Sweetening rhubarb is a casual affair, and I don’t usually bother measuring, but these approximations should work. This will yield enough rhubarb syrup for several drinks, and a mass of greenish fruit that can be spooned over ice cream, mixed into plain yogurt (my favorite) or just eaten over the sink with a spoon (also my favorite). Chop rhubarb into cork-sized chunks and place in a non-aluminum saucepan. Pour sugar on rhubarb, then add enough water to barely cover the rhubarb (about a cup). Bring up to a boil, then simmer, stirring frequently as the sugar melts, for at least 25 minutes. Turn off heat and let cool for an hour or two. Strain out the rhubarb solids. If you are picky, you may use a fine-meshed strainer and strain several times to remove the sediment. Set aside solids for another use and pour bright pink liquid into an appropriate bottle. Refrigerate. Hi again from Buffalo. Feeling homesick this week with the rain here, but research is going well. So many fantastic snippets and nuggets here in the wonderful Special Collections. My roommate is a fellow graduate student, and she’s been keeping me amused with things like red velvet cupcakes and spiced lentils. And the librarians and scholars have really made me feel welcome — trying to stuff me full of nourishing brainfood. Still, not much cooking. I’ve been eating simple salads with good cheese, roasted beets, fennel, tangelos, walnuts — basically any combination that seems delicious. Concocted a tagine-free chicken apricot tagine, which was made by roasting the chicken, onions, lemons, and apricots, then simmering the roasted stuff with chicken broth and herbs. Not bad. But the news from home is better! My story on micro food networks appears in the Eugene Weekly Chow! section today — check out the whole issue, since it’s a good one and speaks of many changes on the Eugene restaurant scene. Thanks to everyone who told me their stories about sharing food amongst neighbors. Recognize yours? And if you don’t see yours, or you know of other active web links for Eugene neighborhood food-related resources, please post the URL with a comment! Also, I wanted to mention some upcoming MFP classes. Sign up by mailing in the form on the Extension webpage (see link to the right) or by calling 541-682-4246. The last class on gluten-free cooking was wildly popular and over-enrolled. If you haven’t taken one of these classes, you don’t know what you’re missing! All classes include instruction, hands-on projects, recipes and a homemade lunch. You won’t see a price like this for high-quality, joyous culinary instruction anywhere else. May 30: The monthly class series continues with “Foods from Mexico.” This class has been in the works for months, and it will feature family recipes and other delights from the Jalisco region, prepared by native cook Alejandra Bernal de Mendez and the Master Food Preservers. 9-2, Ext. Office Auditorium, $30.00. Sign up to reserve your space right away, since this one will fill up. June 6: Fie on expensive camping dried food! This month’s class is “Dehydrating Foods.” Learn how to dehydrate your own meals and snacks for camping, hiking and emergency preparedness. 9-2, Ext. Office Auditorium, $35.00. NEW!!! And for those of you who prefer your cooking classes fast and free, check out our Saturday mini-class series at Down to Earth’s downtown store. They’ve asked us to partner with them to educate the community this summer. I’m teaching two of the classes, Water Bath Canning and Flavored Oils and Vinegars. May 23: Water Bath Canning, 1 to 3. Come join me to learn (or relearn) basic canning techniques for fruits, jams, and pie fillings! June 13: Food Drying and Freezing, 1 to 3. June 27: Flavored Oils and Vinegars, 1 to 3. Come join me to learn safe, delicious, and unusual ways to flavor oils and vinegars! July 18: Pressure Canning, 1 to 3. August 1: Canning Pickles, Tomatoes and Salsa, 1 to 3. I have been asked for my beef jerky recipes several times, but since the notes were a mess, it has taken me a while to post the recipe for my favorite, Thai jerky. If you’ve never had home-dried beef jerky, you’re in for a treat. I have never really liked the flavor of store-bought jerky, because of all the preservatives and fake flavors that keep it shelf-stable for a commercial market. Even the “premium” stuff tastes primarily of salt, and the flavors don’t really distinguish themselves. There is rarely a marked difference between pepper jerky and Cajun jerky and teriyaki jerky. When I made my own jerky for the first time, I realized that you could transform it into something incredible. The drying enhances the flavor of the beef, and with strong spices, you can experiment with myriad flavors from international cuisines. I tried my own teriyaki recipe, then Korean bulgogi, then Thai. I couldn’t stop eating jerky! This is dangerous, given you are at risk of eating 2 lbs. of salted meat in a short period of time. If you have more restraint, though, jerky makes an unusual and delicious cocktail snack. 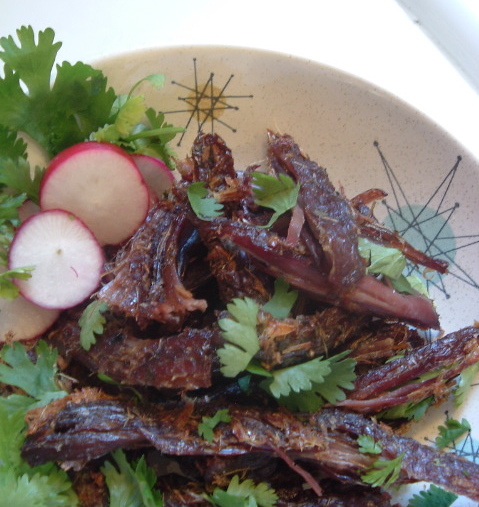 My recipe for Thai beef jerky is based on a classic Thai dish for sun-dried beef. In Thailand, the beef is dried in the sun, then deep-fried and served as a main dish. The deep-frying will kill microbes, but it does not keep like regular beef jerky. My recipe eliminates the sun and the fryer. You’ll need a good quality food dehydrator for this recipe. I’ve seen jerky recipes made in the oven; if you lack a dehydrator, I suppose you could try drying it at 200 degrees with the oven door ajar, but I can’t guarantee the results. There are two ways to make jerky that ensure you kill microbes: heating up the raw meat in marinade to 160 degrees, or heating the strips in the oven to the same temperature after the drying process is completed. The OSU Master Food Preservers prefer the former, but it doesn’t work well with this recipe, so I use the latter, a method recommended by the preservation experts at University of Georgia. Planning: You’ll need a food dehydrator and food processor. Drying will take several hours. I use flank steak because I like the texture for this recipe, but you might want to try a cheaper (lean) cut, such as round, sirloin, or rump. The crucial step is to remove all the fat from the meat. Freeze meat for 10-15 minutes to ease the slicing process. Slice meat thinly — ¼ inch thick or less – and try to make pieces the same length and width to ensure quick, even drying. I aim for strips that are 2 inches wide and 4 inches long for ease of handling, but you might make them a different size depending on your needs. Cutting the meat *across* the grain makes for tender pieces; cutting *with* the grain makes for a chewier jerky. The photo shows what cutting with the grain looks like. Trim away all fat from the outside. Place finished meat strips into Ziploc bag with tight seal. Place all marinade ingredients in food processor and pulverize into a paste. Add paste to meat strips and massage to combine. Refrigerate overnight. The drying process should take place at 155 degrees, or as hot as your dehydrator can get. Dry until the meat cracks but doesn’t break when you bend it, with no moist or underdone spots. This might take anywhere from 3-8 hours or more, depending on your dehydrator. When the jerky is done, remove it from the racks and place on a baking sheet in one layer, not touching. Preheat oven to 275 degrees, then heat for 10 minutes to reach a 160 degree internal temperature. This will kill any remaining nasties. Cool and serve as a snack with beer or with other Thai courses. Can be garnished with radish slices, a chiffonade of kaffir lime leaves, lime wedges, and/or cilantro. I make jerky in small batches and store it in the refrigerator in a sealed bag, since we eat it quickly. It can also be stored on the shelf. For longer storage, store it in the freezer. It should be safe at room temperature, but why take chances? You’ll discover that any bits of fat left on the meat will go rancid quickly, and the overall quality will start to decline on the shelf. I’m sure you’ve been intrigued by the new “flat iron” cut of beef, especially if you’re trying to buy more sustainably raised and butchered cowflesh. Our local supermarket, Market of Choice, seems to be extraordinarily fond of this budget cut, promoting it in roasts and marketing it in the big saver packs for the budget-conscious consumer. I would imagine other higher-end groceries are doing same. 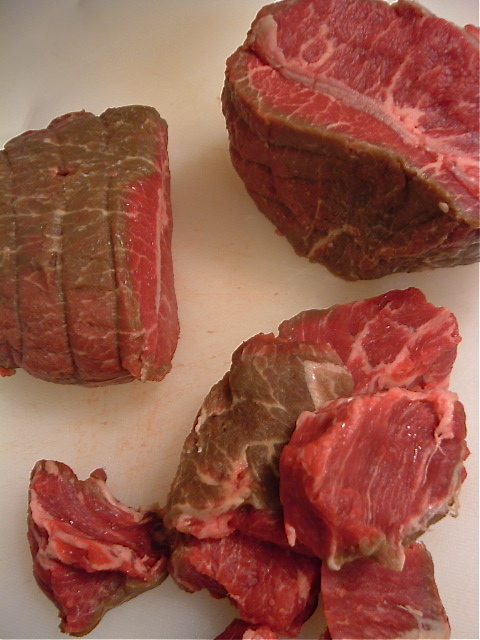 The flat iron cut comes from the shoulder, or chuck, part of the cow. It’s also called a top blade steak. The flavor and chewy texture on one side is reminiscent of a thick, juicy, meaty flank steak; the other side is more tender and mild, but still with excellent flavor. 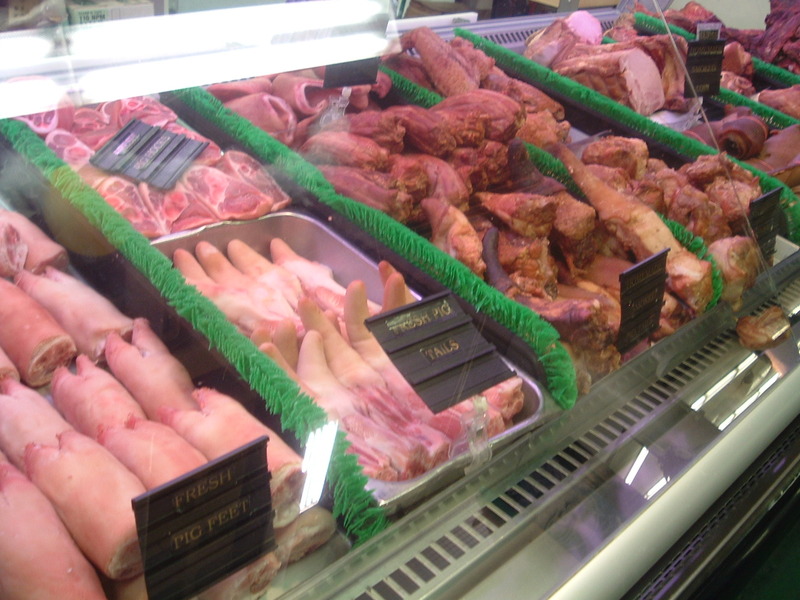 Butchers often recommend marinating it and not eating it well done: very good advice. With all those positives, why is it considered a “waste” cut? Well, if you’ve tried it, I am sure you’ve seen why it’s a bargain for premium meat, and why it hasn’t been sold until recently. There is a piece of gristle that runs down the center of the steak lengthwise, kind of like a T-bone but smaller and grosser, that makes eating it difficult. 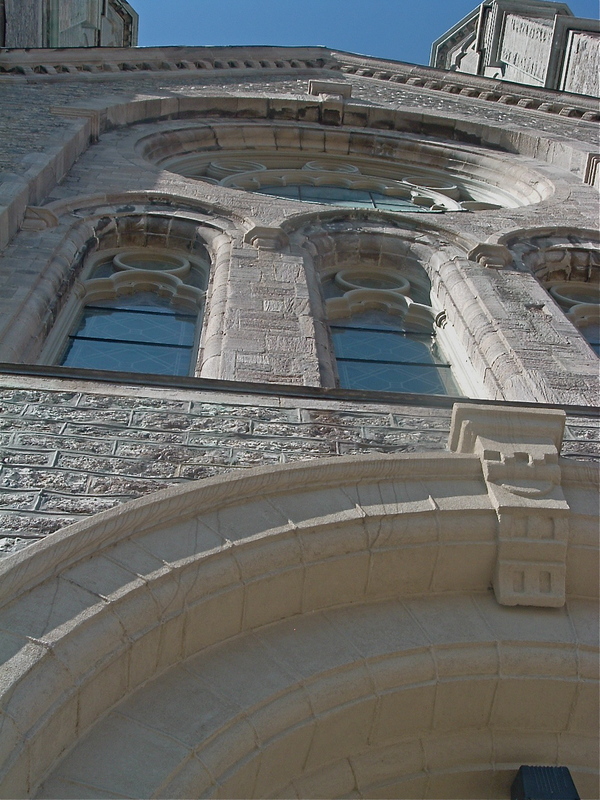 The image shows it well in the upper-right corner. But why let a little gristle come between friends? I found it quite easy and profitable to buy flat iron cuts whole, in a roast the size and shape of a — wait for it — flat iron, then carefully cut the meat into kabob chunks about 2 x 2 inches. As kabobs, flat iron cuts grill beautifully. I experimented with broiler kebabs this winter, and learned that butchers are absolutely right about keeping the meat at medium or rarer — they turned to burnt chewy sawdust when I became distracted in dinner preparations one evening. Ack. But grilled or broiled medium rare, they are quite delicious. As for a marinade, I’ve treated these steaks as I would a porterhouse: just a bit of olive oil, salt, and pepper. They are also delicious with a spice rub, some za’atar, or pulverized onion. Serve with lemon wedges, rice pilaf, a dilled cucumber yogurt salad, and a smile. Have you found other ways to utilize this cut that you’d like to share? 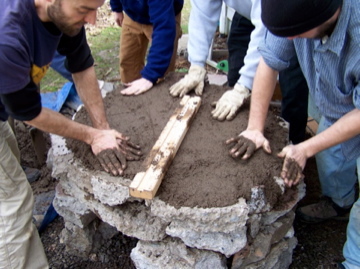 Trying to convert your lawn to a sustainable garden? Grass removal is made easier by a hazel hoe or this handy little number called the Green Grubber, available at Pacforest in Springfield, which was recommended on a forum on the Friendly Neighborhood Farmer’s social networking site. Note that the root-running bent grass that is creeping all over Friendly won’t be stopped by a scalping, since little pieces of the root regenerate like those broomsticks in Disney’s Sorcerer’s Apprentice. But you can try. I recommend scalping followed by cardboard and sheet mulching, then eternal vigilance.